In this article, I will discuss and demonstrate the use of Business Events in E-Business Suite (EBS) to integrate it with other applications using Integration Cloud Service (ICS). The Oracle Workflow Business Event System is an application service that leverages the Oracle Advanced Queuing (AQ) infrastructure to communicate business events between systems. This functionality is leverage by ICS to register a subscription with EBS for an event which is invoked when the event is triggered. In this article I’ll explain this in detail. ICS provides Oracle SaaS customers with pre-defined to connections to most SaaS subscriptions and zero-code integration features to quickly connect SaaS applications. E-Business Suite can be installed in a customer’s data center or on OMCS or on IaaS (Infrastructure-as-a-service). It may be installed allowing access from Public Internet, or behind the firewall where access is restricted to only within the corporate network. In case where EBS is publically accessible, ICS can integrate with EBS directly. In case of Business Events, connectivity agent helps automate the process of registration of ICS integration which needs to be invoked when the even fires. When an integration in ICS which uses EBS Business Event as a trigger is activated, ICS registers the integration as a subscriber to that particular Business Event. Since ICS cannot directly communicate with EBS, if it is behind the firewall, it writes the message to a queue which is read by the connectivity agent which in turns registers the integration as a subscriber. 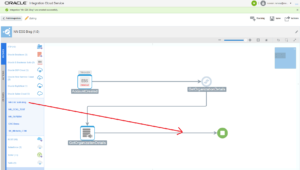 Once the subscription is created, EBS can directly invoke the integration with the event payload since the firewall blocks incoming connections to EBS and not outgoing HTTP(s) connections from the EBS to ICS. There are other tasks that you need to perform on EBS before it can be used with ICS for integration using Business Events. These steps include setting up Integrated SOA Gateway REST Services, deploying the required REST services, setting up ICS credentials etc. To perform the required setup, please follow the instructions in page Setting Up and Creating an Oracle E-Business Suite Adapter Connection of Oracle E-Business Suite Adapter documentation. For this article, I’ll take an example where there is a requirement to keep Trading Community Architecture (TCA) data in sync between EBS and Oracle Sales Cloud (OSC). EBS is on-premises and behind the firewall so it cannot be accessed from internet. I will demonstrate how to use ICS to achieve this real-time integration. 2. Download the connectivity agent installer from ICS and install it on a separate server. This agent will help receive messages from ICS and pass them to EBS. Read the complete article here.